‘Product Market Confidence’: Are you comfortable with what you sell? As a startup founder and possibly even more so as part of a team (anywhere!) it’s easy to have a lack of ‘Product Market Confidence’ – i.e. The belief/knowledge that what you sell is of value anddoes do good when people buy it. Over the years of connecting with ambitious rebels all over the world, I’ve realised some of the biggest anxieties when growing revolve around the suitability of a product and the pricing. It goes without saying that if you’ve started to build a product, you’ve hopefully identified a problem; likely one you personally have exposure to, if not experience directly. From there it should be a given that what you’re selling is of value because you know it’s needed – you need it yourself! That confidence sometimes flits in and out though and the rest of the time is spent wondering if what you’re pushing is actually worth what you say it is. 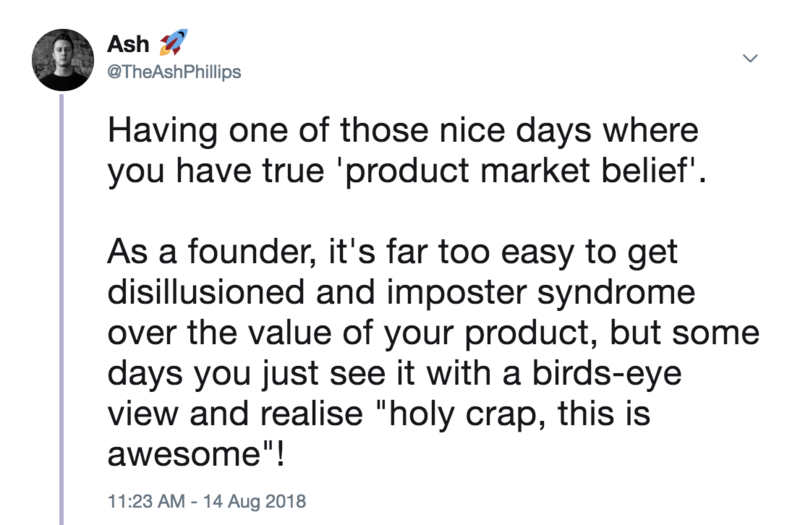 These regular bouts of doubt and imposter syndrome are actually powerful if harnessed in the right way, to help you build an ever-growing, ever-evolving product, experience & ecosystem. Try not to focus on them too much though. Remain self aware during these periods of doubt, otherwise you can easily get carried away and lose all sight of the value you’re already bringing. My advice? : Ask your ‘old self’ if this would be of value to you. What I mean by that is that the ‘you’ that has developed this product will, by now, likely be desensitised to it’s value (because you’re so close to it and work with it every day). It will have probably lost it’s glamorous sheen and so there’s a temptation to add that back all the time with self-serving idea generation and PR gigs. As mentioned, these are important but don’t let it stop you from doing the most important thing – Selling. Put yourself in ‘old you’s shoes. Would the old you buy it right now? Often the answer is actually “Hell yeah!” which can reignite that confidence in your product and get you back on track with the important sales that will fund the next developments. One of the biggest issues everyone has when starting out is pricing themselves. This is applicable to professionals too because you have a salary – that is your value. Your confidence (or lack thereof) around this, could mean thousands of pounds of difference in salary, revenue, profits, etc every year. So, get it wrong and you could be living on the breadline. Get it right and you could enjoying that tropical holiday you’ve wanted for a while. Know your target & divide by working hours in a year ⌚How much does your ideal lifestyle cost? And how much do you need to earn to make that possible?Take that figure, divide it by 2087. (The number of working hours in a year based on a normal work-life balance). That’s technically your hourly rate. However, you won’t fill every hour with billable workso double this figure to account for 50% of time spent on admin, delivery and biz dev (or triple it to be safe). Doing this can give you confidence in the knowledge that this is what you’re worth. As if others are on that salary too then it’s the market expectation and as long as you’re delivering it to standard or (hopefully) beyond it (to make good value for money) then you’re good. Sell on value I used to sell on cost all the time. Sponsorships, memberships, campaigns… everything! Based on how much it would cost someone else to do this without me.Wrong.Thanks to the advice of many peers and advisors (the importance of a network!) I’ve fixed this mentality over time and now sell on value. What does this mean? Well things have much more value than just their cost. If they didn’t retail brands would go out of business for a start! Watches tell the time, yet people will buy a Rolex for £5k and a Topman watch for £5. What’s the difference? The experience, the story, the delivery, the quality, the feeling they get when they use it and the perceived value of why they want to own it. If I told you my hourly rate was £1,000 without batting an eyelid, you would think I was reassuringly expensive. If I told you it was £10 in the same way, you might devalue me because I was ‘too cheap’. Think about this when you price your own services. …Especially in service businesses as you’ll always over-service clients and therefore underprice yourself. Yes, they paid for 25 hours of your time, but did that really include the inconvenience of a 9pm phone call?! No. From there, get selling your wares and let me know how you get on! If you’re ever unsure of the value, just ask ‘old you’ or, ask the Yena community as they’re always willing to chip in & help – just one of the huge benefits of membership; and honestly, worth the £9/mo on it’s own. Why host a Rebel Meetup?